With the din of Ginebra’s landmark 2016 Govs’ Cup championship run has quieting down and the swirling controversies around the 2016 PBA Draft coming to a halt, we have arrived at the cusp of a new PBA season. In a few days, we will usher in a new campaign where the best and brightest of Philippine basketball take the stage again and battle for the ultimate hardwood crowns this side of the hoops world. In this spirit, let’s look at some of the players to watch heading into the new season. 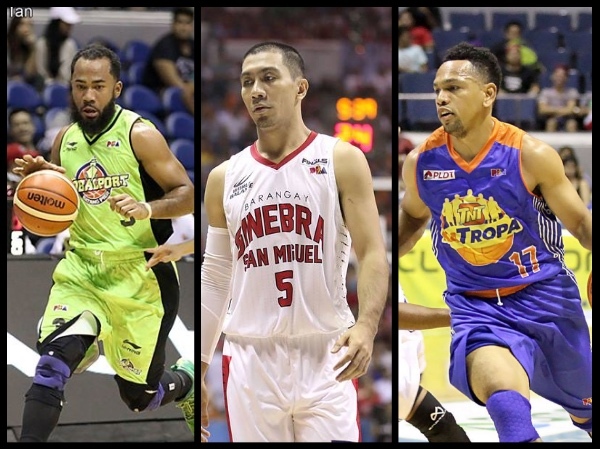 For this first edition, let’s look at the Top 5 Point Guards entering the 2016-2017 PBA season. 5. RR Garcia (SMB) - 14.6ppg, 3.1rpg, 2.7apg, 1.8 triples per game, 33.8 3pt%, 42.8 FG%. - RR enjoyed his most stellar season in 2015-2016 playing for Barako Bull/Phoenix, and he will take all his talent and magic to… the San Miguel Beermen. We’ve seen this before — see Brian Heruela — but I’m personally hoping Garcia has a better experience moving to a team that already has Heruela, Chris Ross, and the next guy on this list. 4. Alex Cabagnot (SMB) - 14.3ppg, 3.6rpg, 4.0apg, 1.9 triples per game, 34.2 3pt%. - Should Cabaggie be worried that his club just took on a fourth point guard? Not really. Cabagnot has enough talent and experience to still be a major cog for SMB, and don’t be shocked if he actually moves to the other guard spot this coming season. For what it’s worth, though, he was one of the Beermen’s best scorers last season, and he should continue being among SMB’s top guns in 2016-2017. 3. LA Tenorio (GIN) - 13.0ppg, 4.1rpg, 4.5apg, 1.2spg, 1.6 triples per game, 38.7 3pt%. - Tenorio had a forgettable 2014-2015 season, but he bounced back in a beautiful way in 2015-2016. Of course, it was all capped with that wonderful title-clinching run in the third conference, and, for sure, the Lieutenant is looking for more success in the coming 2016-2017 season. It’s great to see that, despite getting up in age, Tenorio remains one of the best playmakers in the league. 2. Stanley Pringle (GLO) - 19.3ppg, 5.8rpg, 4.5apg, 2.3 triples per game, 39.8 3pt%, 48.3 FG%. - Amidst persistent rumors of his transfer to other PBA clubs, Pringle remained resolute in helping the Batang Pier do well last season. They peaked a little too early, though, and the 29-year-old Fil-Am will definitely try to carry GlobalPort to greater heights this coming season. He had big jumps in scoring and three-point shooting last season, and the big question is will we see even more marked improvement from him in 2016-2017? 1. Jayson Castro (TNT) - 20.3ppg, 4.0rpg, 6.1apg, 1.1spg, 2.3 triples per game, 34.2 3pt%. - I am quite disappointed that Castro didn’t get a formal offer from any Chinese team. He would have been the perfect ambassador of Philippine basketball abroad, but, of course, the flipside is we continue to get treated to his brilliance here. The Blur just turned 30 this year, though, so don’t be too surprised if there’s a bit of a dip in his production. Still, given his work ethic and innate talent, Castro should still be among the PBA’s best when all is said and done. Oh, and don’t close the door on a possible return to Gilas Pilipinas as well. LA Revilla (MAH) - 10.6ppg, 3.7rpg, 4.1apg, 1.4spg. Mark Barroca (STA) - 10.2ppg, 4.5rpg, 3.9apg, 1.2spg, 1.3 triples per game, 35.6 3pt%. Mike Cortez (PHX) - 9.9ppg, 3.7rpg, 4.3apg, 1.0spg, 30.4 3pt%.